Ph.D. (Submitted) in Metallurgical and Materials Engineering from National Institute of technology, Rourkela. M.Tech. in Process Metallurgy from National Institute of Technology, Surathkal in 2012. B.Tech. in Metallurgical and Materials Engineering from Mahatma Gandhi Institute of Technology, Hyderabad in 2010. Worked as an Assistant Professor in National Institute of Technology,Bhopal from July 2017 to July 2018. Worked as a Teaching Assistant in National Institute of Technology, Rourkela from Jan 2013 to June 2017. 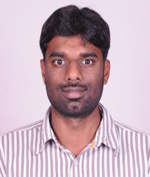 Worked as an Assistant Professor in Institute of Aeronautical Engineering, Hyderabad from Jan 2012 to Jan 2013. Trinath Talapaneni, Natraj Yedla, Smarajit Sarkar and Snehanshu Pal. Effect of basicity, Al2O3, MgO content on the softening and melting properties of the CaO-MgO-SiO2-Al2O3 high alumina quaternary slag system. Metallurgical Research & Technology, vol. 113, pp. 501-511, March 2016. Trinath Talapaneni, Natraj Yedla, Snehanshu Pal and Smarajit Sarkar. Experimental and theoretical studies on the viscosity-structure correlation for high alumina silicate melts. Metallurgical and Materials Transactions B, vol. 48B, no. 3, pp. 1450-1462, March 2017. Trinath Talapaneni, Natraj Yedla, and Smarajit Sarkar. Study on desulphurization capacity of high alumina blast furnace slags at 1773 K using slag-metal equilibrium technique. Metallurgical Research & Technology, (accepted). Participated in an oral session in NMD-ATM 2014 held at Pune (India) on November-2014. Participated in short term training program on “Design of experiments: An optimization tool (DOEOT-2014) held at NIT Rourkela on 22-25 December 2014. Participated in a three day workshop on “Experimental techniques in extractive metallurgy (ETEM-2016) held at IIT (BHU) on 10th July 2016.